Finding a great credit card without having credit history can be challenging. In many cases, however, lack of credit history can be waived for cards with low S$500 credit limits, or with a fixed deposit as collateral. Based on these features, we’ve identified and compared some of the best credit cards for no credit history below. Some credit cards waive lack of credit history when you pay a fixed deposit as collateral. If you can afford the payment, you can access cards with much higher rewards rates. HSBC Revolution Card is a great, affordable option as a first credit card, as long as you’re willing to pay a fixed deposit. Those willing (and able) to pay S$10,000 as collateral can receive a waiver for lack of credit history. This waiver is later returned, but will not earn interest in the meantime. Returning to rewards, HSBC Revolution Card is by far the best on the market for local social & online spenders. Cardholders earn 2 miles per S$1 on local dining & entertainment, as well as for online spend (including travel bookings and bill pay). There’s no minimum spend requirement and no rewards cap, so earning is fairly easy and straightforward. In addition, the S$160.5 fee is waived with S$12,500 annual spend, making the card quite affordable. Overall, if you don’t have credit history but can afford to pay a fixed deposit, HSBC Revolution Card offers the best way to earn miles. If you can afford to pay a S$10,000 fixed deposit as a credit waiver (returned later), CIMB Platinum MasterCard is an excellent choice for a first-time credit card. Cardholders earn at top market rates of 10% cashback on travel, transport, and wellness (including both medical and beauty expenses). While there’s a S$600 minimum spend requirement, cardholders can earn up to an incredible S$100/month–or up to S$1,200/year. Other perks include eCommerce Purchase Protection, and the card is free forever. Many credit cards with S$500 credit limits waive, or do not require, established credit history. The following cards are great options available to young working adults. If you’re looking for your first credit card, you should definitely consider CIMB AWSM Card. In order to qualify, you must either be a student or a salaried employee earning at least S$18,000, if younger than 35 years old. This is fairly reasonable for most first-timers with no credit history. Cardholders earn 1% rebate on dining, entertainment, online & telco with no minimum spend and no cap on earnings. This rate is great because it covers key spend categories for many young adults, and is also 4x the rebate offered by some alternatives. You may also be interested in CIMB AWSM Card for its convenience, affordability and perks. Cardholders can ‘tap & go’ to pay for bus and train rides. They also have access to exclusive MasterCard privileges and CIMB Deals & Discounts, which offer specials throughout SE Asia. Finally, CIMB AWSM Card is free forever. If you have no credit history and want a starter card, there’s no better option. Standard Chartered Manhattan S$500 Card is worth considering if you don’t have any credit history, and don’t want to pay a big fixed deposit to earn a waiver. Consumers must be students, or low income working adults earning at least S$18,000/year. This is one of the only cards available to employees at this salary level. Cardholders earn 0.25% flat rebate on all spend. While this rebate rate is fairly low, SC Manhattan S$500 Card is great for new starters. There are no categories or merchants to track; all spend earns rewards. In addition, cardholders can earn up to 15% cashback on Grab rides–though this requires a S$900 minimum spend (and may therefore be less accessible to people with lower incomes). There’s a S$32.1 annual fee, which is quite low and waived 1 year. Overall, if you want an easy-to-use rebate card to build credit, consider SC Manhattan S$500 Card. CIMB Visa Signature Card is great as a first-time card, though consumers must pay a S$10,000 fixed deposit as a credit waiver (which is returned later). This deposit, however, may very well be worth it–cardholders earn a market-topping 10% cashback on dining, groceries, and online shopping, up to S$100/month. It’s worth mentioning that there’s a S$600 minimum requirement, so low spenders may not be a great match. However, cardholders also enjoy great perks–like free travel insurance–and the card is free forever. Below, we've prepared a summary of our picks for the best credit cards for no credit history in 2019. 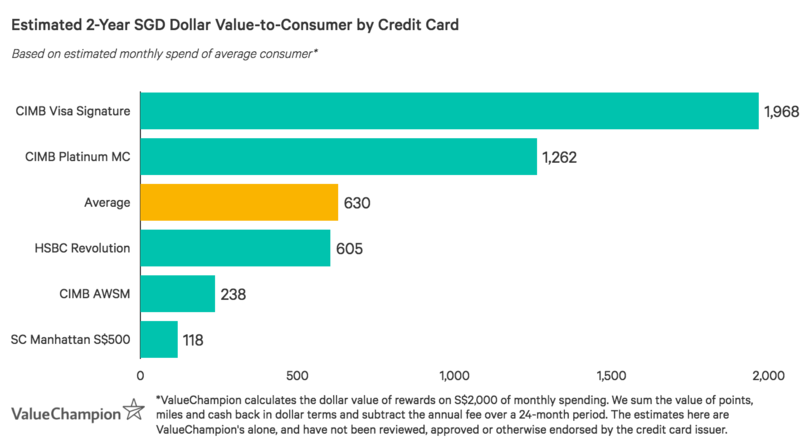 The graph below represents the approximate value-to-consumer (in SGD) of the best credit cards for those with no credit history in Singapore. Dollar values are calculated based on approximate rewards earned with a S$2,000 monthly spend for 2 years. This number varies, however, depending on individual spending habits.